Most will know the basic function of a crossover - to filter the incoming audio into the separate bands covered by each drive unit - but there is much more to consider besides this. In addition to the basic filtering process, the crossover must also provide corrective equalisation to give a maximally flat frequency response. Some of this might be required because of the behaviour of the chosen drive units, but some aspects are necessary because of how a loudspeaker behaves in a real listening room. In some ways, it's easy to understand why we need to employ some form of filtering. Consider the tweeter, with its small voice coil, wound with lightweight copper wire that is as thin as possible and attached to a very small diaphragm that might only be around an inch in diameter. This assembly is so very small because if it is to produce an extended high frequency response, it needs to move backwards and forwards 20,000 times a second. Yes, 20 thousand times a second! Intuitively, such a fragile assembly clearly needs protection from the low frequency energy present in most recorded material. 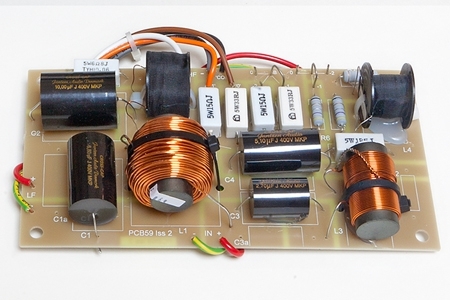 Should you accidentally connect a tweeter directly to the terminals of a conventional hi-fi amplifier, it will almost certainly be damaged. So the crossover ensures that only upper midrange and treble energy is able to reach the tweeter. Turning to the woofer, it's hopefully also intuitive that this unit needs to be able to move large amounts of air. Just consider the physical reality of a string bass, or a kettle drum! So a large diaphragm - several inches in diameter - is used. And compared to the tweeter's, the voice coil will be a much more robust affair that is able to absorb higher power inputs. Naturally, this assembly will weigh considerably more than the equivalent used by the tweeter, and so won't be able to move at the same velocity. This means that the acoustic energy produced by a woofer will naturally fall away as the frequency rises. So why do we need to provide a filter for the woofer? Indeed, many systems in the early days of hi-fi did not - they simply allowed the woofer to roll away naturally, and arranged for the tweeter to "take over" at a hopefully appropriate juncture. At this point, we must remember that all loudspeaker drive units - no matter what the technology - are imperfect. As explained in the drive units article, the diaphragm might behave as a piston at lower frequencies, but this behaviour changes at higher frequencies, where the inner parts of the cone begin to move separately to the outer sections. Naturally, this process is not perfect, and at certain parts of the spectrum, significant peaks and troughs can occur. If the loudspeaker is still being asked to produce acoustic energy at these frequencies, serious colouration of the reproduced sound will result. Indeed, similar problems can occur with a tweeter as well. One of the first tasks when designing a crossover is to carefully examine the "raw" frequency response of each drive unit - mounted in the enclosure, but not fed via any sort of crossover (beyond a "safety" filter for the tweeter) - to see how each drive unit behaves outside of the expected range of frequencies. This is important because a crossover filter does not work in an abrupt fashion. A 2 kHz filter does not suddenly stop passing the signal at 2.1 kHz! Far from it - relatively gentle "slopes" are employed for a number of good reasons, but it does mean that at the crossover frequency - and perhaps at least an octave either side of that - both the woofer and tweeter are contributing to what the listener hears. And this is why each drive unit needs to work well beyond its crossover point - and indeed the characteristics of both drive units will dictate the choice of crossover frequency to a strong extent. An otherwise ideal bass drive unit mounted in an enclosure will exhibite a rising trend, and if this is not corrected, the complete loudspeaker will seem to lack bass. This effect - sometimes called "baffle step" - is related to the width of the enclosure, and is caused by low frequency energy curving around the sides of the cabinet. To correct for this, we must progressively boost the low frequencies by an amount which corresponds with the gradual loss. But of course, in a conventional loudspeaker, a crossover can not make the incoming signal larger. So to achieve an apparent bass boost, we have to provide a midrange and treble cut. Because this causes a loss of overall efficiency, the overwhelming temptation is to reduce the amount of correction, and advise the end user to place the loudspeakers against a rear wall or similar in an attempt to mitigate the loss of warmth that results from insufficient baffle-step correction. But doing this can cause other problems. Ultimately, it's better to accept the need for correction, which gives the owner the ability to place the loudspeaker in the optimum part of the room for the smoothest overal frequency response and best stereo imaging. There are many other complexities to consider when designing a passive crossover, and few designers can juggle all the conflicting requirements as successfully as Derek Hughes. To compliment the careful design, premium-quality components are specified to ensure a long service life. The inductors are wound by hand by Volt Loudspeakers, who are also responsible for assembling and testing the complete crossovers. When they arrive at Graham Audio's assembly area, they are tested again before being installed inside the loudspeakers.